Master Higgins is back, baby! It's Nintendo Download time again folks! This week we've got a tasty trio of European gaming greatness to tell you about. Adventure Island: The Beginning (WiiWare, 1000 points) is Hudson's latest instalment in its long-running Adventure Island series. This 2.5 platform title - which stars legendary Hudson employee Takahashi Meijin - is one of the most promising titles we've seen in a while. Look out for our review over the next few days! Crystal Defenders R1 (WiiWare, 800 points) was released on Monday in the US and is Square-Enix's take on the incredibly popular 'Tower Defence' genre. We awarded it a respectable 7/10, so it's definitely worth checking out if you're a fan of this type of game. Real Football 2009 (DSiWare, 800 points) is Gameloft's first sporting venture on the DSiWare platform and looks very much like their previous DS-based exploits - which were actually pretty damn good. Naturally you might want to wait until our review goes live before making a purchase, though. So there you have it. Anything take your fancy out of that little lot? Will you be throwing stone axes at evil-doers, defending shiny gemstones or kicking a piece of leather around a soggy pitch with a bunch of overpaid muscle-heads? Let us know in the comments section below! So, DSiware updates are every week. My expression right now is the same as when Popoie the sprite (Secret Of Mana) gets upset. I think i will be purchasing Adventure Island when i get home from work, i should probably be virtually slapped by someone for not waiting to read the NL review first but i have a good feeling about this one. What's sad is that I actually know that look. Good to see europe getting more than 1 wiiware/vc release a fortnight again. How's that sad? Secret of Mana is awesome. I've played through it like 5 or 6 times. And that face he does is adorable. Okay maybe sad wasn't the right choice of word.....dorky probably fits better. Fix'd. Football? You corny Europeans, when are you ever going to realize that football is not football unless you score touchdowns instead of GOOOOOOOOOOOOOOOOOOOOOOOOOOOOOOOOOOOOOOOOOOOOOOOOOOOOALS! Huh this early with tyhe releases . I thought the schedule normally be 10:00 AM Adelaide time but this is half an hour early . @greyelephant: It'd probably sell really well here if "Fútbol" were in the title. The only football I want to watch is the game where you can knock somebody's helmet off with their head still in it. Very nice! While I haven't gotten anything since the begingng of the month I'm eagerly awaiting the next time I get Wii Points so that I can download Crystal Defenders R1, but I'll have to see what my birthday brings me before I get any Wii Points since DSiware might just get some focus if I get one. Hopefully Adventure Island comes out here relatively soon! WTF! Why do you get Adventure Island and Crystal Defenders this week and why do you still have Bubble Boble Plus and we don't? Yeah why do you guys get iPhone downgrade and Ugly Game, and we don't have pretty good game? Also how long until the updated games actually become available? @Stevie, Nice argument man, I support your views completely. @greyelephant, would you like some ice for that burn!! 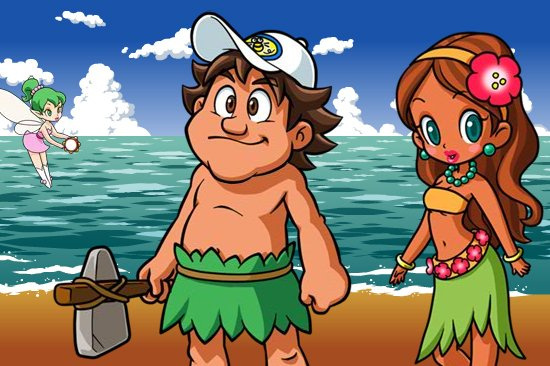 @Supermarioman, go read the news article "Europe Gets Adventure Island: The Beginning On WiiWare Tomorrow" (I'll give you a hint, it's the one before this one) and read my rant about release dates. Then come back and complain about Europeans getting games before Americans. Initial thoughts on Adventure Island; Seems pretty solid at the moment, although the controls are a little unresponsive at times. The graphics are also a little blurry- Hudson obviously had to do a lot of compression on this to fit it within the size limit (which is ridiculous now that we can launch games from the SD card). But anyway, it's pretty much what I expected it to be, with solid but not outstanding level design, and some decent minigames. Worth the download, but definitely could have been better. 2.About how corny all sports announcers are, no matter the sport/country. 3.About how not to be the thead police. 4. About the fact that I don't think Greyelephant was that serious. If we're really going into the "i'm from this region which is currently getting 'screwed' more than other regions at the current time"...please take a break, save your breath and realize that in the long run, NA has more games (than PAL not Japan of course) even though they've had a run of much better weeks lately. It better be Daz. Havn't seen him review in a while. A. To me is all that I care about. A. Read above the above. A. I thought we were talking about Football.....or I mean Futbol. You silly Britts and your dry sense of humor. Good to see us Yanks stick together. U DA MAN! 4. About the fact that I don't think Greyelephent was that serious. Please let me know how you get on "
2. Sports commentators are not always corny however a vast majority of them are so I'll give you that one. 5. Use spell check "greyelephent"
We've got him on the ropes! And don't worry about it, Stevie, making fun of soccer is just what American sports fans have to do. I'm pretty sure it's a law. Since this is dragging on too long and I don't want to jack the thread, I'll just put it this way: my post was made in good humor. I wasn't trying to chastise Stevie or get into some long arguement about the pros and cons of soccer vs football. (hey, I'm American. I have to call it soccer) And typo? What typo? I don't see any typo in my post. I certainly didn't go back and edit it, that's for sure. Are you Mo on the EU rankings? I can't wait to see how Adventure Island does. Fingers crossed that it's a must-download! I'm looking forward to the Real Football review, since I'm quite interested in the game, which probably isn't too far off from being released stateside. Well another week where I don't regret Amazon still not having my bloody point cards for delivery...two releases again! Nice update, you all in EU really deserve these lately nice updates, still, there's just one little thing that's bothering me... I WANT MY BUBBLE BOBBLE! Really nice Update Thanks Nintendo! Adventure Island owns, 8/10. This has been another helpful review from your friendly neighborhood q-man, hope you liked it. Two games I'm interested in here. That's rare for an update. While the only one on that list I'd buy is Adventure Island I'm still interested how the Football game works out, that thing does look pretty advanced for a DSiWare game (and I think there's a retail version too?) and I wonder how much got stripped out. The short description says it lets you photograph faces for your players and a ball for the ball with the DSi camera. Did you know that there's actually other contries besides USA? "making fun of soccer is just what American sports fans have to do"
But don't worry they will change the name just for you, when they going to release the videogame there little americans that way you don't will be confused. Nah, I'll show up as 'pt' when I can actually work out how to submit my highscores. They don't seem to submit automatically when I connect to the leaderboards, is there another way to do it? And btw, you have Bomberman Blast, don't you? I think I've played you quite a few times....you were pretty damn good if I remember. In Adventure Island, for 12 golden fruits you can unlock a mode where the second controller can be used to control Bomberman and drop bombs on Higgins, I kid you not. Yes, Real Football DS is a stripped down version of the retail version which got decent revws. I don't usually acquire "serious" football games but having played this and considering its value, it works very well on DSiWare IMHO. Incidentally, I just read an article in "The Independent" (newspaper here in the UK) about what they reckoned the top ten classic nintendo games of all time were. The original Adventure Island was number 10! Anyone else have a comment about the quality of Adventure Island? Thank you for saying i am good at Bomberman Blast. I did not like Adventure Island at first. It's my first 50hz 480i 4:3 Wiiware game. Sometimes it looks and sounds bad. I have most of Hudsons Wiiware/VC games. BUT! i played it for about two hours and i am falling in love with it. Yes i love it. Today i will play for a few more hours. It's a hard game. Very hard sometimes. It looks like a kids games. But it is a not kids game. Lot's things to do in the game. High score, Unlocking stuff. Mini games, Bosses. I would give it 8/10. I need to play alot more before i stick with that score. One more thing i like the music and its FUN! to play. It feels like they rushed the DSi out a bit, especially given how many of the early DSiWare titles are nothing more than rehashed parts of previous DS releases. Give it time. I'm betting Mighty Flip Champs will change your mind about the service. At least it seems to be a good start. Adventure Island owns so much that I started it all over from the beginning again. Well, okay, I restarted it because I misspelled my name in one of the minigames and apparently you can't change your name after you've chosen it so it was bugging me and I had to delete my save but who cares, the game is fun. As for 4:3. 2D platformers tend to be venreble to this. The reason being lowest common denomitator. If you make the game 16:9 and cut off the left and right for 4:3 users that means 4:3 users won't be able to see parts of the level which could result in cheap deaths (see: Game Gear veresions of the Master System Sonic games). Still it is kind of sad to hear they couldn't do anything with the borders (Wario Land: The Shake Dimension put some graphics into the borders rather than just being black). ".... i love argument with people that think they are the center of the world (cof cof, Most Americans, cof cof Football Haters cof cof...)"
But I love football....the real American one, anyway. As with my earlier posts, I'm sure someone will come along and think I was dead serious with this one, as well. "It feels like they rushed the DSi out a bit"
Yeah, the DSi has been totally underwhelming so far. I know its early, but Ninitendo should be releasing some killer apps to lure people to upgrade, not just limp along. Come on, Nintendo, lets pick up the pace! Yes Star Wolf your right sir 576i. I got confused. Sorry i have my Wii set up in 480p 60Hz Component cable. I think the game plays in only 50Hz 576i. All my other Wiiware games play in 480p 60Hz. P.S Thank you for telling me why it's in 4:3. That makes sense what you said. Eh, alright week. I'm hoping for Bobble Bobble Plus on Monday. @Corbie, #13. You might be able to do that in NFL Blitz! I also agree about what you're saying about DSiWare. Wiiware was a little underwhelming at it's launch, but at least it started off with some decent games. Tbh, I never had high hopes for the service in the first place (I felt the lack of space would make for some very small, short games), but I'm hoping this whole "take fragments of DS retail games and give them a seperate price tag" trend dies real soon. By the way, I'm loving the football discussion here! I don't know how to tell 576i and 480p apart but the game is letterboxed when your Wii is set to 16:9 so you don't end up with a stretched picture and a need to adjust the TV's display mode every time you play it (as you do with VC games). The game really wasn't polished to look good, the animations are terribly floaty and sometimes your vertical velocity snaps around (in the death animation and when grabbing a ledge and jumping). The hitboxes seem a bit strange at times (though I don't think they're really problematic) and the game is pretty hard overall. I don't like how you slow down for a moment when you fire your weapon on the ground since the fire button is also the run button and this way there's a short slowdown before you start running. I'm not sure but I think in the original Adventure Island one hit would kill you, in this your vitality also acts as a health bar. Which is good since it's easy to land on an enemy. Still pretty hard to stay alive. For some reason the game has a lives system, it seems completely pointless since dying forces you to restart the whole level anyway and all the lives do is occasionally show a "game over" screen. I'm not sure if I'm missing any details but the weapons seem terribly imbalanced, the boomerang is simply the best weapon. Can hurt anything (there are some things the other weapons can't damage), adjusts to ground slopes and flies to the edge of the screen. The lives system is for the bosses. The spear goes through enemies and the fourth hammer is the most powerful weapon in the game. I'm yet to try Adventure Island though, although once I've had my tea I'll certainly give it a shot. I wish that Bit.Trip Beat was out already, though I suppose for Strategy fans (not including myself), Crystal Defenders is another good addition. So Adventure Island is nails?! BTW, I think DSiware has been pretty good overall. The opening releases were generally good IMHO. How long until we get another Rugby game? It's so much better than Football, American or otherwise. That's odd. I emailed them asking the same question and they gave me a confusing answer comparing it to the WiiWare/VC schedule but at the same time said a release schedule hadn't been decided on yet. I wouldn't hold my breath if I were you. It's certainly possible someone will make another rugby title, but I don't think the demand is really that high. On the plus side though, licensing real world players would probably be dirt cheap, though. Well the launch window for DSiWare isn't over just yet as far as I know. One more update for us before that window closes.